.hack//SIGN was one of the first anime shown by Cartoon Network and it left a lasting, negative impression on me: an otherwise brilliant show with a plot that went nowhere. .Hack//Quantum is the latest iteration of the series. It is .hack//SIGN as it should have been. It’s not a remake, just a three episode version with a similar story. It’s not perfect, but if it had come out eight years ago it could have provided a foundation for subsequent stories. But this late in the game it is underwhelming. 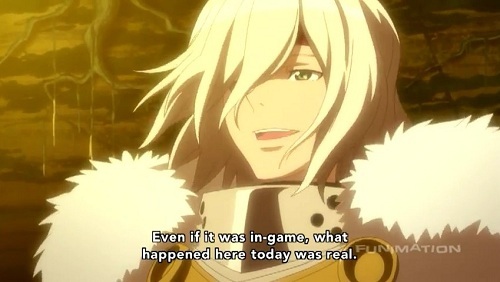 The formula behind the .hack series started promising. .hack//SIGN was released in 2002 in time to capitalize on the popularity of online gaming. 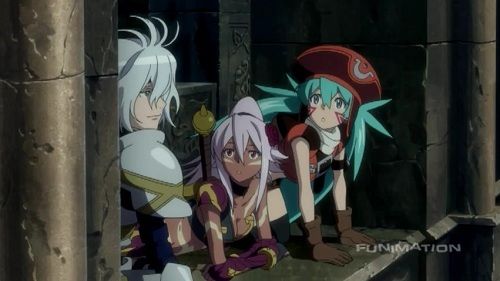 To that end it was as much an extended ad for the .hack video game as a 26 episode series. But that effort was wasted. Bandai could have made a multiplayer game two years before World of Warcraft, instead it made a single player game that simulated a multiplayer one. Basically Bandai gave the world a rehashed Phantasy Star Online, but offline. The anime was a similar waste of potential. It had an amazing soundtrack by Yuki Kajiura, with addicting songs that I must have listened to dozens of times. The animation was high quality for its time period. But the story or lack of the story advancing doomed the project. Episodes passed by without anything of note happening, as if they were filler episodes in a shonen action series. That may be acceptable in a shonen show where time and cost constraints require a company to produce throwaway episodes while waiting for a manga author to write new plot points, but in a self contained story it’s not acceptable. This isn’t a problem in .hack/Quantum, however a more fundamental flaw does exist. Pacing isn’t the issue, Quantum’s three episodes are focused. The story is simple, it’s about three female gamer friends, one of whom needs rescuing. The show itself doesn’t waste time, each scene moves the action forward or fleshes out the characters. But Quantum’s story falls flat because the show’s theme, that games let people escape real life and make friends, is uninteresting. It’s so basic that it has no meaning. I was not expecting Quantum to provide an enlightening discussion about why people prefer making friends online instead of in real life, or whether society unfairly questions the value or utility of such connections, but I did expect better than “friendship is good.” Granted, you can only pack so much message into 75 minutes. But great movies do just that, so great anime should be able to as well. I netflixed .hack/sign, then later, for reasons which escape me, its prequel, .hack/roots. You’re right. The shows could have done a lot more with the concept. Maybe they spent too much (like 99%) of the time in the virtual world and not enough in the real world, or maybe I was waiting for more of a connection. The other thing I remember about both series is that just about every scene begins with a character waiting for another character to show up. Or it’s two characters wondering where a third one’s been recently. The mark of a truly bad adaptation is that it wastes time on the boring aspects of the source material. I think that’s what happened with the characters waiting for others to show up. Movies often make the same mistake, especially book adaptations.